400%+ return on their investment in A/B testing. A 135% higher conversion rate from Facebook ad traffic, which is their primary traffic source. A massive customer research survey, covering over 100,000 KeySmart customers and garnering over 12,000 responses. That’s a 4x ROI, minimum. And Draft’s work went well enough that KeySmart chose to renew four times. We’re thrilled with how well this went for KeySmart, and are excited to see what happens next with their business. KeySmart is a key organizer that pops your keys out right when you need them – and reduces the jingle and pocket holes that you get from a typical old keychain. Over 2 million people own one – and that’s partly because of our work. 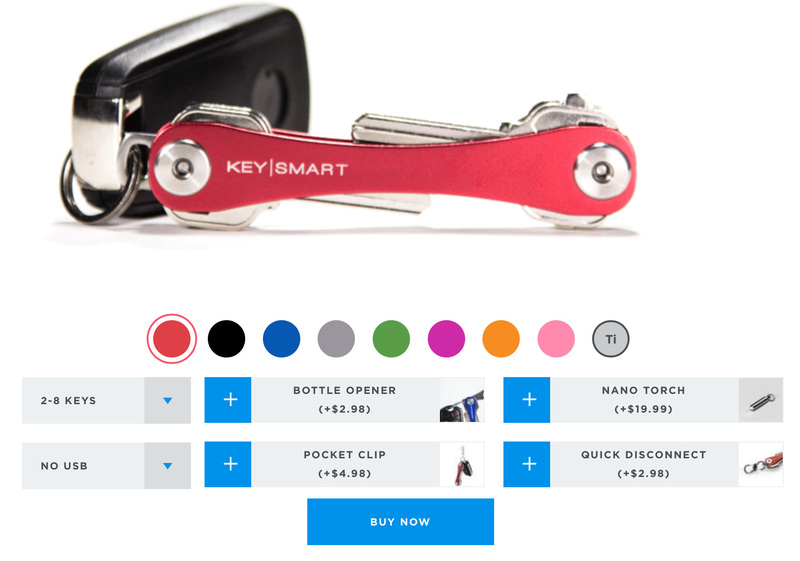 For 15 months, KeySmart used Draft Revise to A/B test and optimize their store. Over that period, we launched 23 A/B tests, 10 of which were winners – one of which successfully reduced their manufacturing expenses by almost a third. In conjunction with a comprehensive, year-long Facebook ad campaign that KeySmart launched, we also helped them convert Facebook ad traffic by 135% at the end of our engagement. We conducted the vast majority of KeySmart’s design research during this period, surveying hundreds of thousands of customers, fine-tuning analytics, and running ongoing heat & scroll maps. Finally, Draft acted as a part-time design resource for the business, mocking up new features and coordinating with developers to clean up technical debt and ensure that everything got built. We created a taxonomy for their product line, reworked their information architecture, and designed a whole new product configurator that will make it easier than ever for people to design their own custom KeySmart. Clicking “I Need a KeySmart” takes you to the KeySmart’s product page. Clicking “I Have a KeySmart” takes you to the list of KeySmart accessories. This significantly improved conversions, as it provided a simple choice for all traffic that came into the home page – and a clear next step for each branch. Are you on Shopify Plus? You should probably A/B test your store. As one of Shopify’s bigger success stories, KeySmart taught us a lot about what works and what doesn’t on Shopify – and what works when optimizing a Shopify store’s out-of-the-box theme. If you’re on Shopify Plus and sell in enough volume to A/B test effectively, or are just wondering what converts well on your store, reach out and apply for Draft Revise today.